Haunting, hypnotic grooves from iconoclastic trance bluesman Otis Taylor. 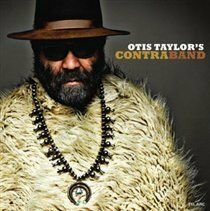 'Otis Taylor's Contraband' offers 14 compelling originals, the subject matter of them will be familiar to his fans as he sings of love, social injustices, personal demons and war. Otis Taylor isn't defined by any single category. A musical alchemist and a true innovator, Taylor has never been afraid to experiment beyond the blues tradition. He's a master craftsman who has created his own signature "trance blues" style by melding haunting guitar and banjo work, syncopated rhythms and a combination of gruff vocals, shouts and yells with raw passion. "When I sing, I just do what I do," Taylor explains. "Whatever comes out that's the way I leave it. And if I make a mistake, I leave it in. I like to keep the emotion." Otis Taylor's Contraband is evidence of that. On his latest album Otis is reunited with several longtime collaborators including the supple-toned Ron Miles on cornet, pedal steel guitarist Chuck Campbell from American Sacred Steel gospel group The Campbell Brothers, djembe player Fara Tolno, a master drummer born in Guinea, West Africa, fiddler Anne Harris from Chicago, IL and the Sheryl Renee Choir. Bass is handled by Taylor's daughter Cassie and Todd Edmunds. Rounding out the band are Jon Paul Johnson on guitar, Brian Juan on organ, and Larry Thompson, former house drummer for Colorado's world-renowned Caribou Ranch recording studio.